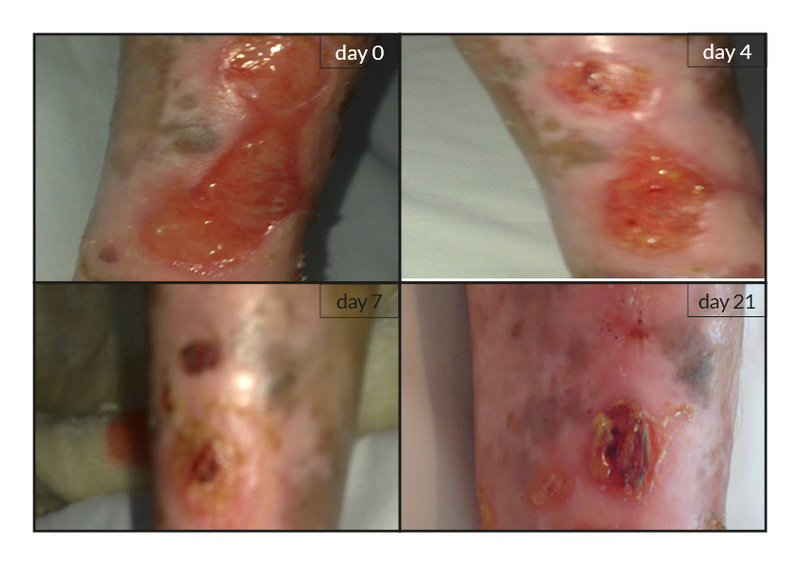 To date, tens of thousands of patients are benefiting or have been treated with the RGTA®-based therapy which was used to treat a wide range of wound types . 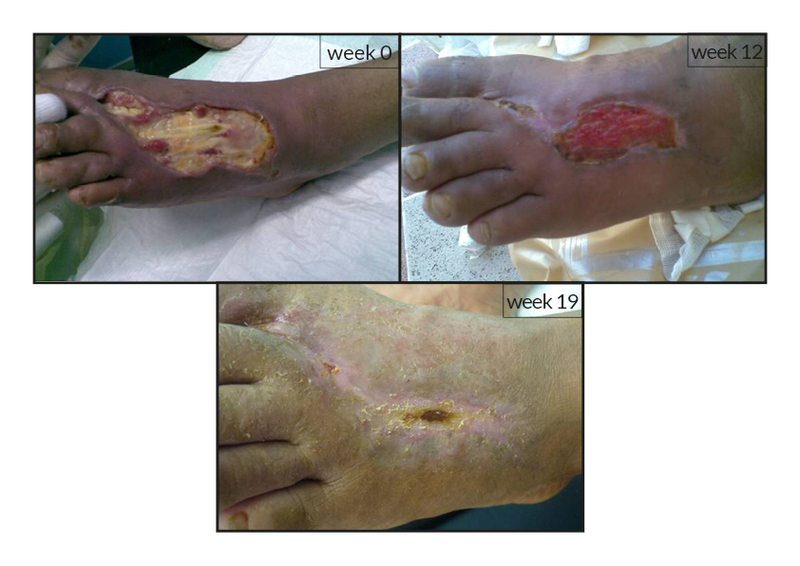 RGTA® abilities to heal skin wounds has been proven with patients mostly presenting with chronic ulcers associated with diabetes [2,3], limb ischemia , pressure ulcers, vascular-related cutaneous defects , burns  etc. which could be aggravated when patients undergo renal dialysis or immuno-suppression treatments (cases illustrated to the right). 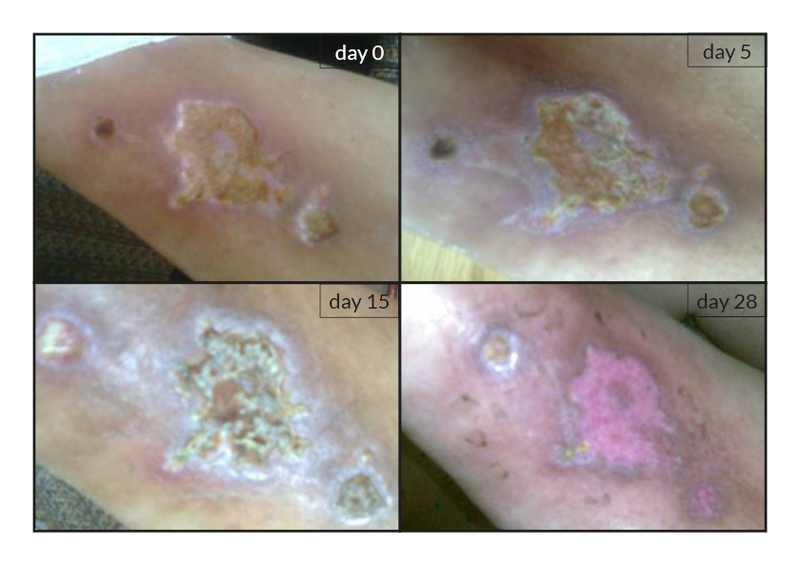 Moreover, RGTA® treatment successfully apply to patients presenting with ulcers caused by radiation  or some rare diseases such as epidermolysis bullosa , sickle-cell disease  or Stewart-Bluefarb syndrome . 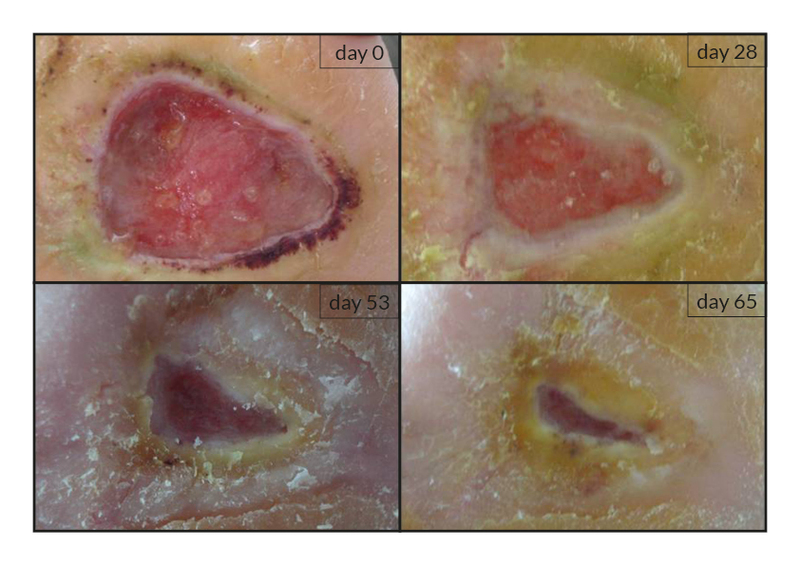 In addition to chronic wounds, RGTA® were also used for treating acute lesions, such as after trauma or illustrated by cases of patients suffering from open wound trauma or recovering from reconstructive and plastic surgery . 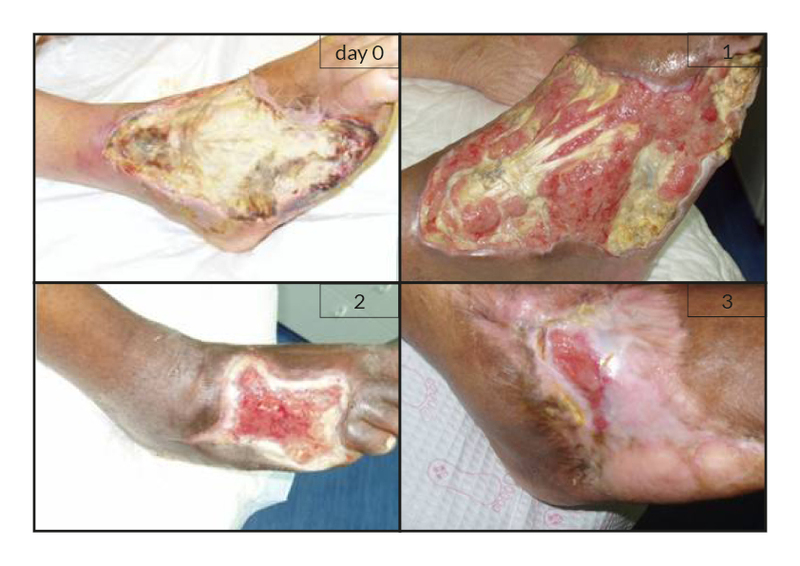 Most patients treated with RGTA® are adults, but some successful results were observed with a 10-year-old patient presenting with Charcot’s syndrome, who ran a high risk of leg amputation. Interestingly, pain relief was reported and measured in several cases by patients treated with RGTA® [4, 5, 8, 9]. Although, the molecular mechanism underlying this phenomenon is yet ill-defined, this observation is of great importance as to the role of RGTA® in injury treatment as well as patients’ quality of life. 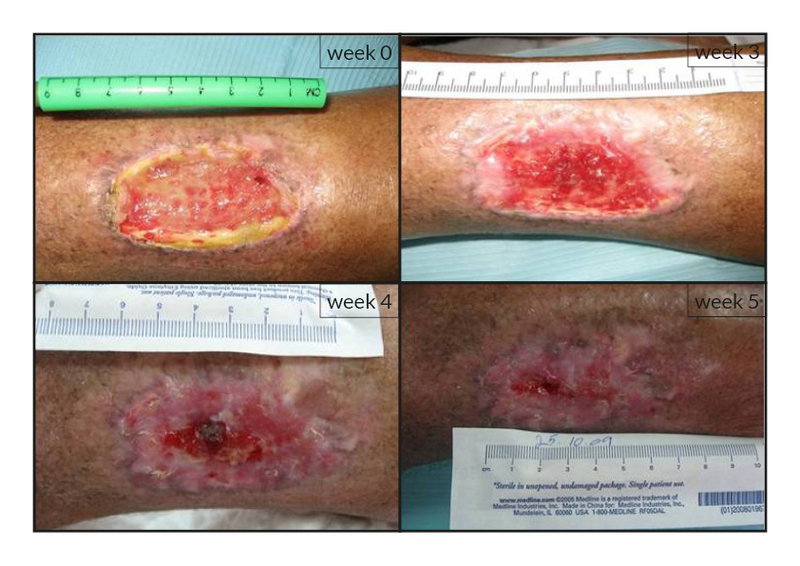 Noteworthy, the patients treated with RGTA® have been presented with unsatisfactory treatment solutions as they failed to respond to standard treatment of wound healing and were considered in therapeutic failure. Altogether, these observations show the importance of RGTA® treatment with respect to the health state and the well-being of patients. CACIPLIQ20® is the RGTA®-based product commercialized by OTR3. 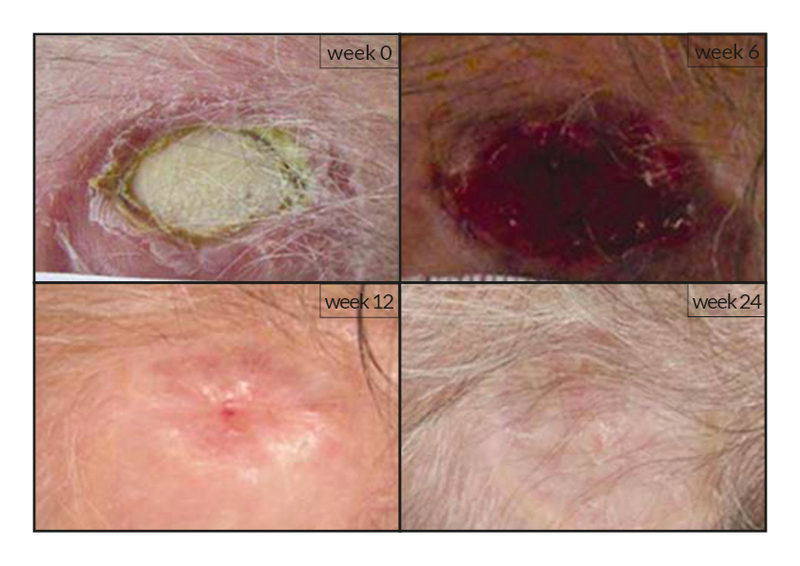 It increases the speed and quality of skin repair by protecting the matrix microenvironment of the wound.